Client Spotlight: FFG at IMTS 2018 | Absolute Exhibits, Inc.
For over 30 years, IMTS has been the premier destination to exhibit manufacturing technology. Held every two years, IMTS features manufacturing technology that perform a wide variety of functions. This year, IMTS broke records with over 2,500 exhibitors covering 1,424,232 sq. feet of exhibit floor space. 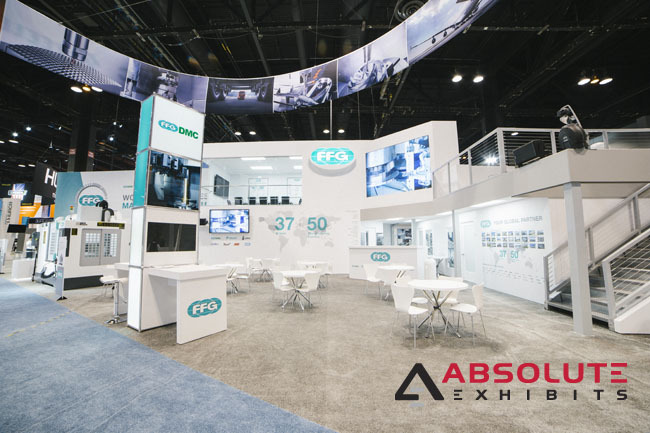 At IMTS this year, FFG partnered with Absolute Exhibits to produce a 10,000 sq. foot trade show booth that maximized their impact on the trade show floor. FFG is a global manufacturing technology corporation which specializes in CNC machine tools, power tools & equipment, construction machinery, pneumatic equipment, printed circuit boards, LCD monitors & TV, solar cell conductive adhesives, LED lighting, magnesium alloy forging, and more. 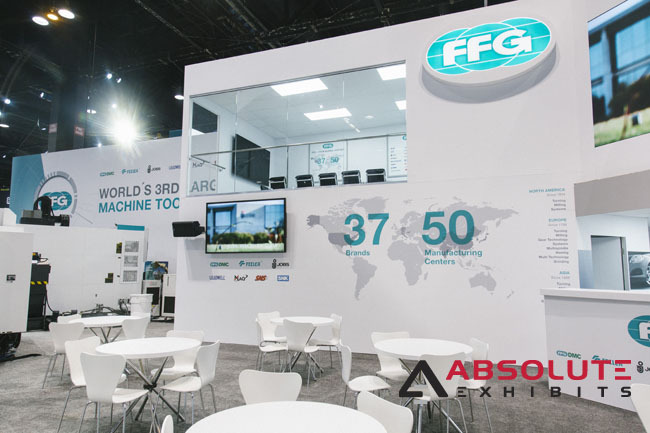 To highlight this wide variety of products, FFG wanted to maximize their impact on the show floor and enhance usability for prospects within their trade show booth. Absolute Exhibits was challenged to produce a visually stunning double- deck trade show booth to communicate their quantum leap in business over the past 2 years. 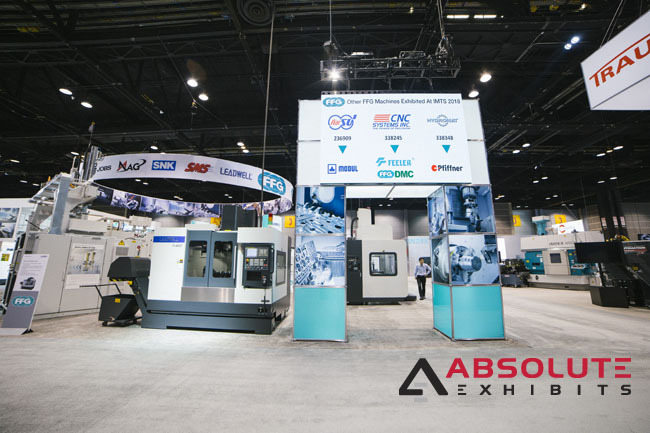 Absolute Exhibits built a fully customized trade show booth that truly brought a collaborative vision to life. The booth itself was constructed of wood CAM panels with wall paper graphics. A private executive meeting room was constructed to host prospects and discuss business in a comfortable environment. Overhead was a massive double-sided fabric hanging sign announcing their different divisions and brands. A light box arch greeted people as they entered the booth, where they could view their CNC machines. Inside the booth, light box towers offered trade show booth staff the ability to give demonstrations. Additional interactive touch screen displays offered people the ability to view their machine technology products and immerse themselves in the brand. “Our team was very proud to bring FFG’s vision to reality. Paul was truly inspired and our collaboration produced a work of art. This truly was a labor of love,” said Senior Account Executive, Tauny Thompson. The FFG trade show booth earned very positive compliments- from prospects, coworkers across the globe, and show attendees. They had a huge impact on the trade show floor, leaving competitors breathless. ” Absolute Exhibit’s team enabled me to envision the impossibilities and turn it into reality. What set them apart was their entire team was proactively thinking of their customers’ needs and selflessly propose these to the customer without additional cost. I’m already looking forward to 2020 to put another architectural marvel on the show floor,” said VP of Business Development and Marketing, Paul Chen.